I missed the dark of the moon on Wednesday for planting my garlic since the seed garlic bulbs hadn't arrived. They did arrive on Saturday and I got them in the ground today. Four days past optimum but we do have a waxing moon which should do the trick. Going big this year with four varieties and dedicating one whole bed to just garlic. (Kettle River Giant, German Red, Chesnok Red and Inchelium Red if you're interested.) A mix of hard neck and soft to see which does best for me. Even when I only plant half as much I usually can't get it used before it dries out so I really don't why I am planting so much other than curiosity and variety. Been really busy cleaning up the summer garden and planting the fall one. Yesterday was two more beds of various cool weather things like Savoy cabbage and red cabbage, More broccoli,Giant Japanese mustard, Romaine lettuce and Swiss chard also went in. I tagged along with Madam's garden club on Friday to tour Joe Lamp'l's garden. He is the producer and host of Growing a Greener World on PBS and his home and garden are just a little North of here. It's very nice. All his 16 beds are made from 6x6 redwood stacked three high and are like mine 4'x8'. Makes for a nice working height and allows for very good soil depth. I'm going to make mine a little deeper but with the addition of a pressure treated 2x10 hooked into the cinder blocks with a 4x4 on the corners...should do nicely. No way I can afford to use redwood 6x6...especially since mine wouldn't be tax deductible. Since he films some his shows in his home garden his expenses are deductible. Oh well..I'll post a picture I took yesterday at Joe's....really a very pretty garden and yes I am a bit jealous of the beds. Rain is starting to move in so I was just in time with the planting today but I did have enough time to harvest some leeks. We have a house guest for the next week or so and tonight they are getting leek and potato soup from the garden(all completely home grown except for the chicken broth). It's here tonight...fall that is. For those of you interested the Autumnal Equinox occurs when the sun passes over the celestial equator moving from North to South. For those below the equator it is the first day of Spring. This list appeared on Twitter but I thought it needed to be shared here as well. This is an important election coming up and no Democrat or Liberal Independent can afford to sit it out. 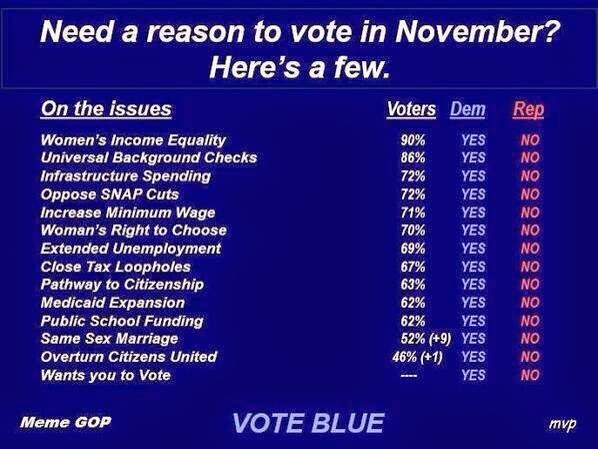 We are facing momentous problems and the GOP is not interested in solving any of them. We can win if we all vote. I decided I needed a rest day today. All I've done in the garden is water. Madam and I took Zoey for a walk around the park. I've started a batch of sourdough bread. That's about it. Mabon is upon us (23 Sep) and the Autumnal Equinox finds me pretty much finished with the summer garden and hard at work putting in the stuff for fall and winter. The experiment with transplanting beets from flats to the garden has been pretty successful as I only lost a couple of percent...I actually did worse with cabbage and even more worse with cauliflower. I am actually going to restart some more cauliflower seeds since I lost so many of the seedlings....might have still been too hot. The broccoli, however, is doing fine...who knows. I'll swing back into action tomorrow but today is chill. I do have picture of Zoey I took the other day to share. She likes to spend the day with me in the garden until it gets too hot and then she moves indoors. She also keeps a watchful eye out for evildoers. The following chart speaks volumes about what has been going on in the U.S. for the last 20 or so years. The fat cats are getting fatter and the rest of us are getting screwed. This is what money in politics translates into when all is said and done. If we don't get the GOP out of government as well as all those Democrats beholding to big money then we have no one to blame but ourselves. fit the budgets of people living on SNAP, the US program that used to be called food stamps. If you’re on SNAP, you already know that the benefit formulas are complicated, but the rule of thumb is that you end up with $4 per person, per day to spend on food. This book isn’t challenging you to live on so little; it’s a resource in case that’s your reality. In May 2014, there were 46 million Americans on food stamps. Untold millions more — in particular, retirees and students — live under similar constraints. I'm fortunate enough not to have to rely on SNAP or actually try and eat on 4$ a day but that doesn't mean I can't follow some of the recipes in this book. I like saving money and this is all good information on being a little more penurious. Thanks to Hecate for sharing this info. Today is Cookie Jill's birthday. It's also mine. Let's wish her a happy birthday. I am still trying to get the garden ready for fall. In between the rain and thunder storms I am trying to clear space for the fall planting. The peppers aren't cooperating. Today I picked all the ripe sweet peppers but there are still a lot of green peppers to go so I can't pull up the plants yet. I also went through and picked about half the green jalapenos and all the red ones. Still a lot of those left to go as well. At this rate, unless I just pull up the still producing plants, I am not going to have enough space for everything I want to plant. Anyhow, all of these peppers are going to the food bank, where they are much appreciated. And yes, I plant too many peppers. The box on the left are Burpee's Big Guy Jalapeno which are really huge compared to the regular Early Jalapenos on the right. The other peppers in the right box are Peach Habanero and boy are they hot!